Preacher at Lissa in the middle of the nineteenth century. He was the author of "Ha-Emunah weha-Ḥaḳirah" (Breslau, 1847), containing a philosophical development of the thirteen articles of belief of Maimonides, and extracts from the Haggadah and from the writings of the ancient philosophers. The work is divided into three parts: "Keter Malkut," on the first five articles of belief; "Shebeṭ Malkut," on prophecy, revelation, etc. ; "Gedullat Malkut," on eschatology. Appended to it is an essay entitled "'Et La'asot," on the religious conditions prevalent in the author's day. 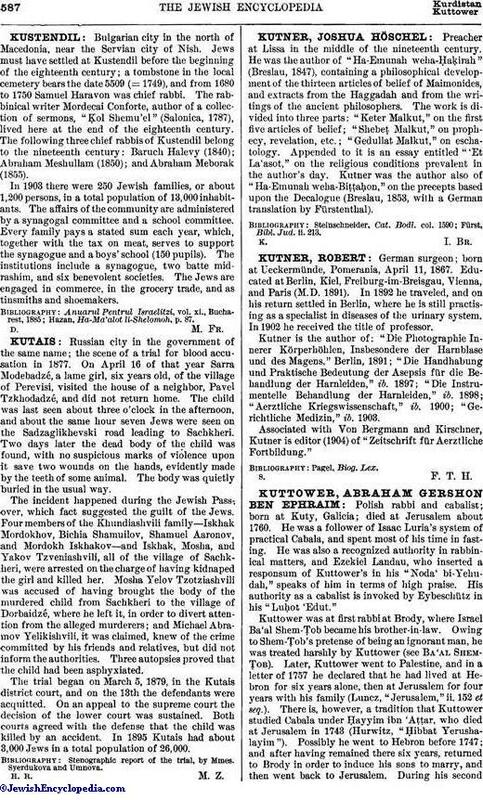 Kutner was the author also of "Ha-Emunah weha-Biṭṭaḥon," on the precepts based upon the Decalogue (Breslau, 1853, with a German translation by Fürstenthal). Fürst, Bibl. Jud. ii. 213.